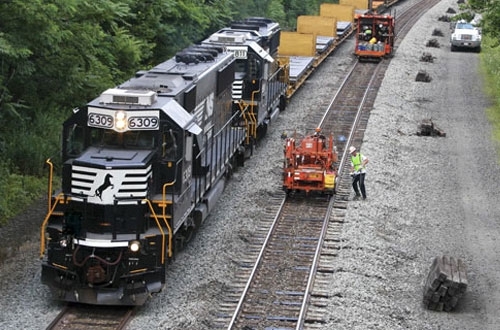 Norfolk Southern is the latest Class 1 railroad to say its 2019 capital spending will be on par with 2018 levels — about $1.8 billion. Jon Zillioux, NS assistant vice president – sourcing, told attendees at the NRC Conference in Marco Island, Fla. that the railroad was looking to “enhance and tweak” infrastructure as it pushes for lower operating ratios. Design and construction (D&C) spending will be “on par with 2018.” Norfolk Southern’s capital spending has declined dramatically since a record $2.4 billion capital plan was announced in 2015. 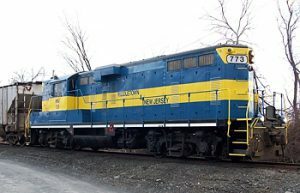 In a call with Wall Street analysts Jan. 24, NS executives declined to give detailed numbers on the 2019 capex forecast, saying the railroad would release further details at its Investors Day in Atlanta on Feb. 11. There is some room for a slight increase in capital spending. The railroad sees 16 percent to 18 percent of revenue as a “solid range” for capital spending during the next few years. Assuming the use of a 17 percent figure, capex would reach about $1.9 billion in 2019. Railway operating revenue rose 9 percent in 2018 to $11.5 billion compared with 2017. The full year railway operating ratio for 2018 was a record 65.4 percent, That marks the third year in a row where NS posted a decline in operating ratio. Overall, the railroad is “progressing 72 projects” in 2019, Zillioux said. Details of the capital spending plan show that there are six network capacity projects, spread across Alabama, South Carolina, Georgia, Virginia and Pennsylvania, in the design stage now. Four other projects are already under way. Norfolk Southern is also planning considerable work at its intermodal facilities, including expansion plans in both Kansas City-Voltz and Chicago-Calumet. Rail replacement will be down slightly overall in 2019, but the railroad plans to add nearly 253 miles of double rail. By contrast, a slight increase is expected in tie replacement as some 2.5 million wood crossties and 2.1 million metric tons of ballast will make its way onto NS property. Wayside will return to “roughly pre-PTC levels,” while grinding and testing will “tip up a bit,” Zillioux said. 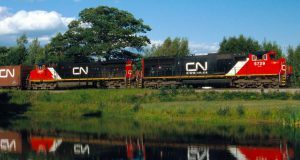 The earnings report is the first for NS since announcing plans in October to adopt the precision scheduled railroading (PSR) practices promoted by the late E. Hunter Harrison, most recently at NS’ eastern competitor CSX. 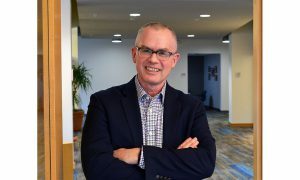 In November, NS named Michael A. Farrell, a veteran of the PSR movement at both Canadian Pacific and Canadian National, as senior vice president transportation. In other news from Norfolk Southern, the Class 1 announced Jan. 22 that Thomas Kelleher would join the board of directors and its finance and risk management committee. Kelleher, 61, is president of Wall Street powerhouse Morgan Stanley. The railroad also approved an 8 percent increase in its quarterly dividend on the company’s common stock, from 80 to 86 cents per share.